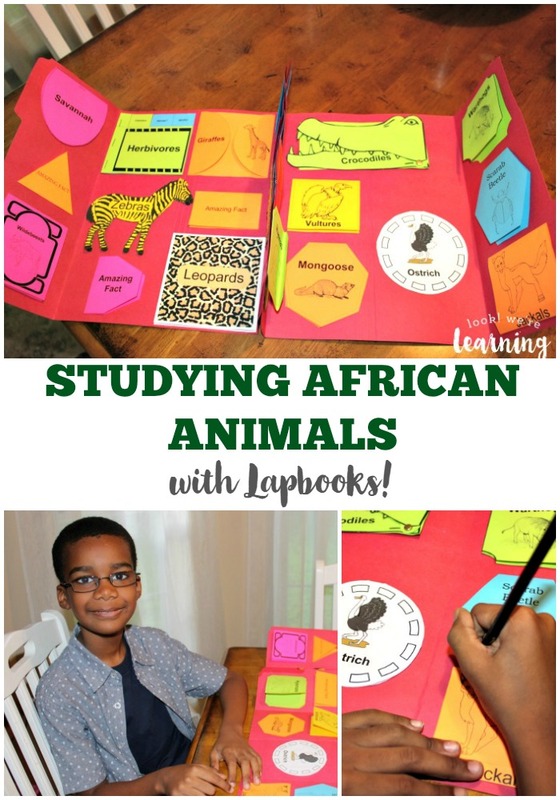 Animals of the African Savannah Lapbook - Look! We're Learning! My soon-to-be third grader is an absolute fanatic about animals. He loves learning about them, talking about them, reading about them, and watching videos about them. 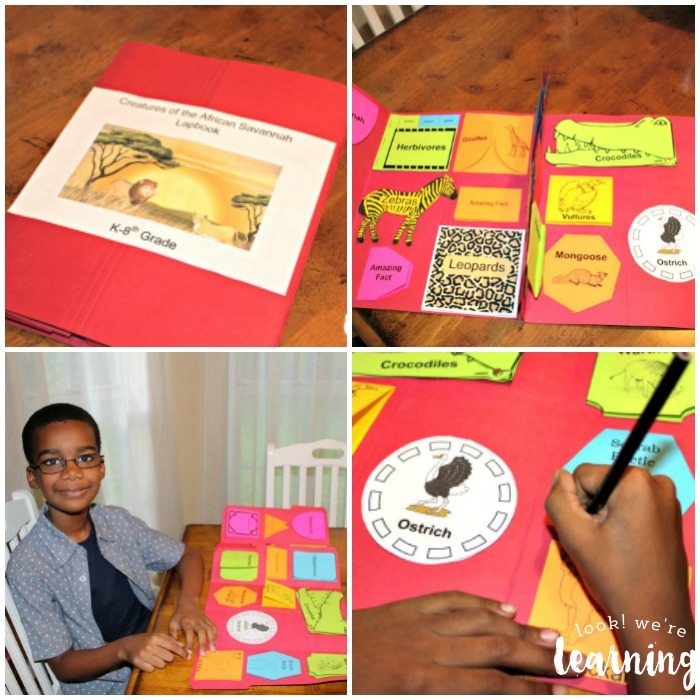 So, this year when I had a chance to renew my relationship with the lapbook company, Knowledge Box Central, I jumped at the chance to try the Creatures of the African Savannah lapbook with him. I just knew he’d love it. And he did! 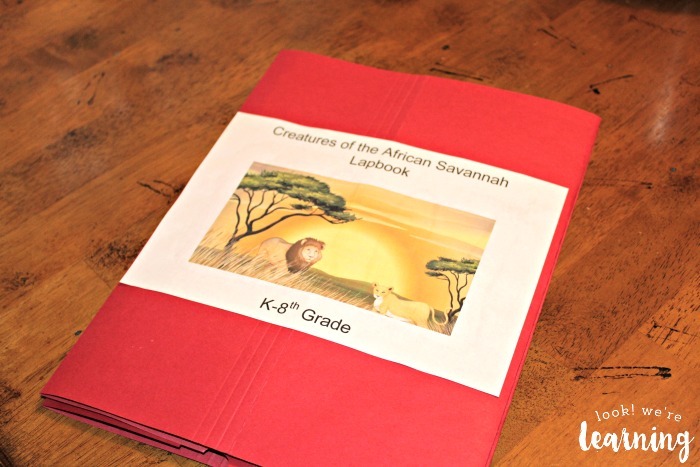 See how we’re learning about the animals of the African Savannah with a lapbook! Disclosure: I received this product in exchange for this post. All opinions are my own and I was not required to post a positive review. 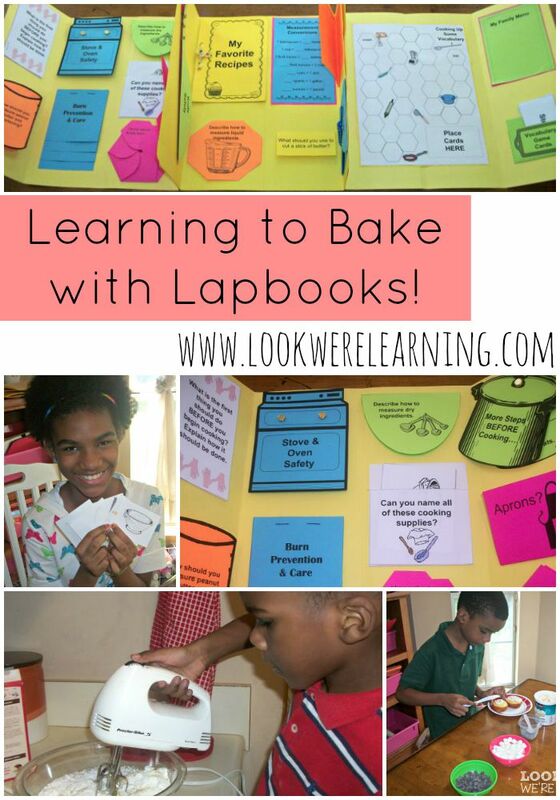 We’ve gotten to try other lapbooks from Knowledge Box Central in the past, including the Cooking Lapbook, the Hurricane Lapbook, and the Math Mini Office Lapbook. Visit our previous posts to take a look at them all in action! I love to lapbook with our kids, but when I was first starting out, the directions seemed a bit…overwhelming. 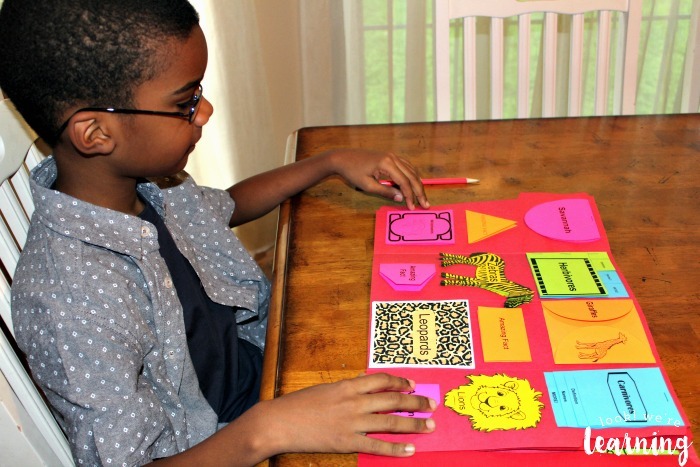 I didn’t know how to get started, where to find good resources to supplement my unit, or how to get my kids interested in completing the minibooks. So I love Knowledge Box Central! 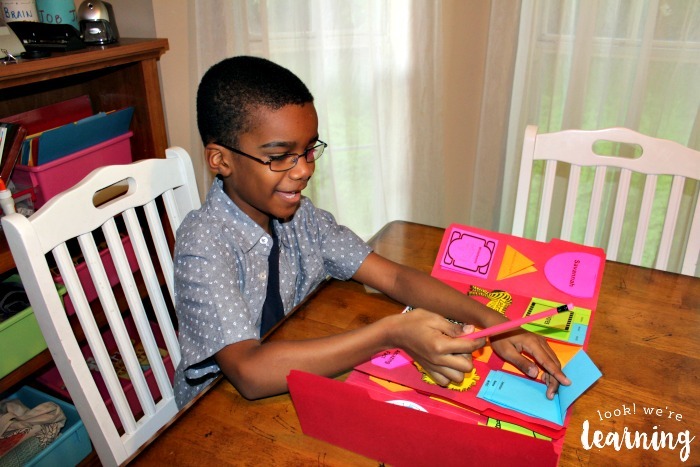 Their lapbooks come with clear instructions and diagrams that show how to assemble each minibook and where to place it in the completed lapbook. 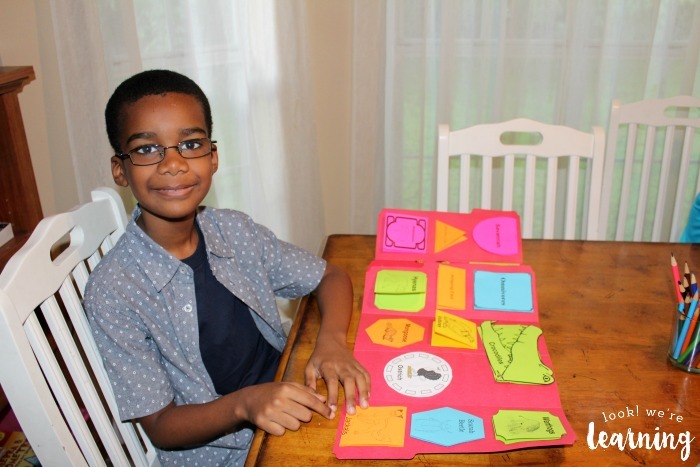 Plus, there is a printable lesson plan at the back that walks you through the information kids can learn and place in each minibook. Voila! Look at that beauty! Whenever I open a lapbook, I get excited. It just looks like there’s so much to do! And since Knowledge Box Central makes it easy to know where to place each minibook, the finished product is always gorgeous. 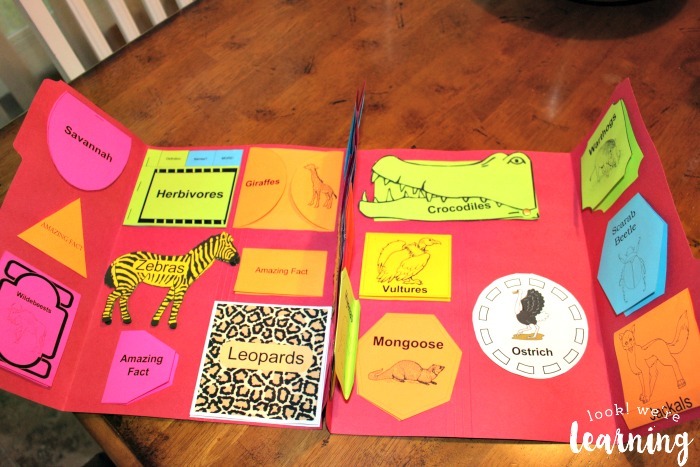 Inside the first lapbook are minibooks about lots of African animals, including leopards, zebras, and wildebeests. 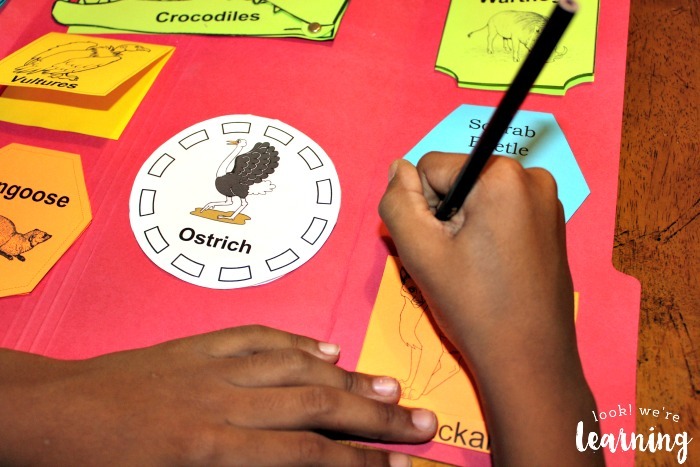 Plus, kids can learn about the differences between herbivores, carnivores, and omnivores – all of which live on the savannah. More animal minibooks are located in the second folder! My third grader wanted to learn more about the animals he wasn’t too familiar with, so we focused on jackals. When he opened it, he just started to smile. 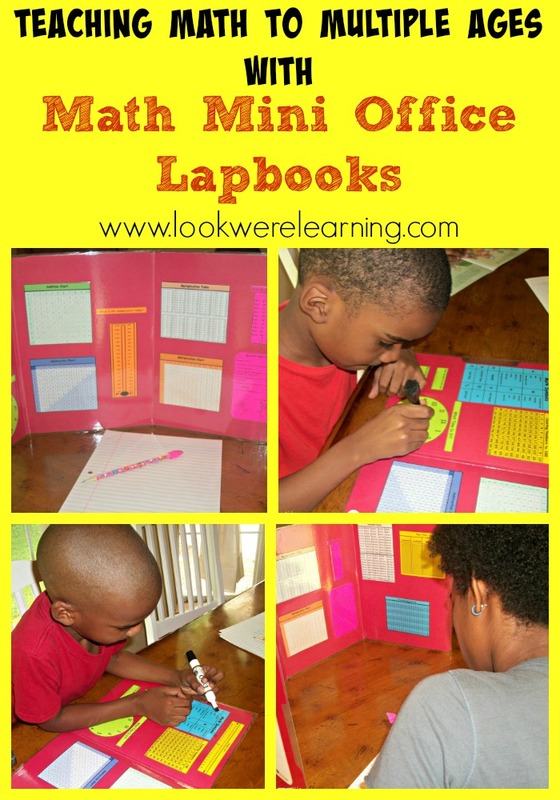 He went through the lapbook, opening each minibook to see how it worked. 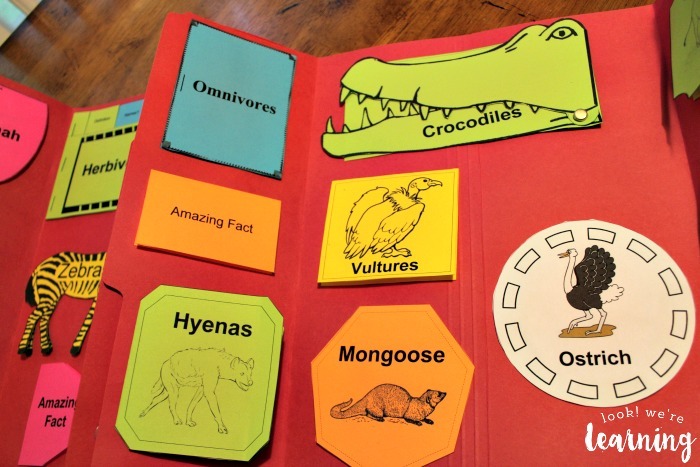 To start, we reviewed the differences between herbivores, carnivores, and omnivores. Since he’s an avid Wild Kratts watcher, he already knew this and proceeded to teach me about it. 🙂 But the information is also located inside the lapbook lesson plan in case you need it. As he explained the differences for each one, he filled in his lapbook. Here he’s working on the Carnivores minibook. After we read about jackals, he wanted to talk about giraffes. We’ve seen them at the zoo, but he didn’t know that they have an 18-inch long tongue! 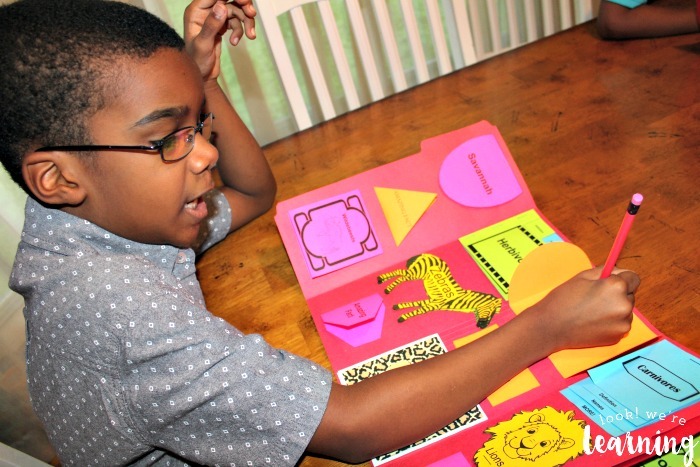 When we read that from the lapbook lesson plan, he just had to write it down in the Giraffe minibook. 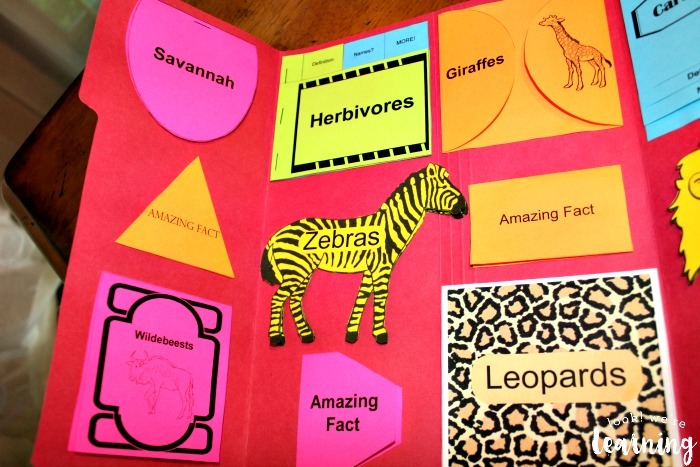 We had a blast with this lapbook from Knowledge Box Central! And we still have a lot left to learn with it! You could easily make this a three-week unit. 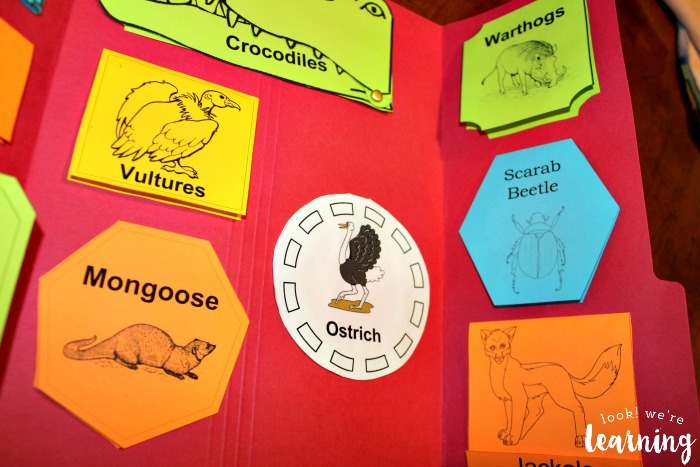 Once you grab your lapbook from Knowledge Box Central, round out your study of the Animals of the African Savannah with these resources! Wild Kratts Season 3 – This season has the episode “Cheetah Racer”, which is based on the African savannah. African Animal Alphabet (National Geographic Little Kids) – A hardcover book for small children, featuring pictures of African animals for each letter of the alphabet. Ravensburg African Animals 3000-Piece Puzzle – This fun puzzle is a way to get the whole family involved in the unit! Here is the African Savanna (Web of Life) – A beautiful picture book that highlights how the various African savannah animal species are connected. 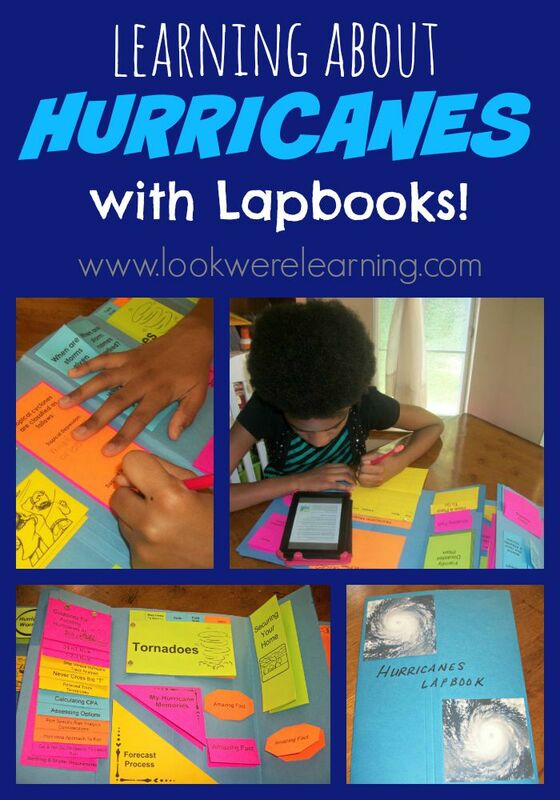 See other gorgeous lapbooks from Knowledge Box Central on display in these posts! 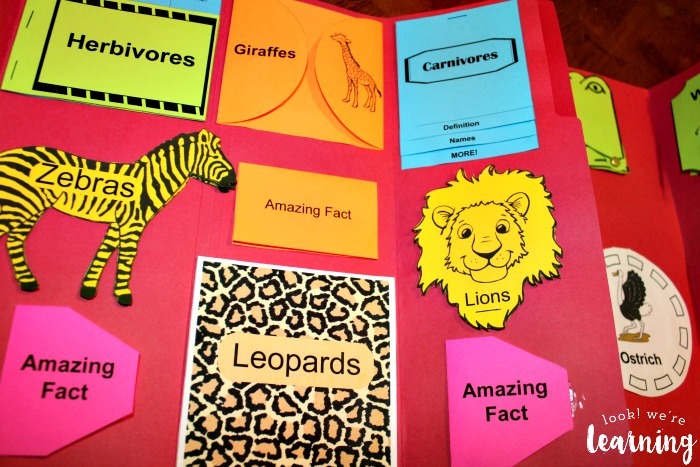 For more tips on how to create your own unit studies, including lapbooking, follow my Unit Studies board on Pinterest!